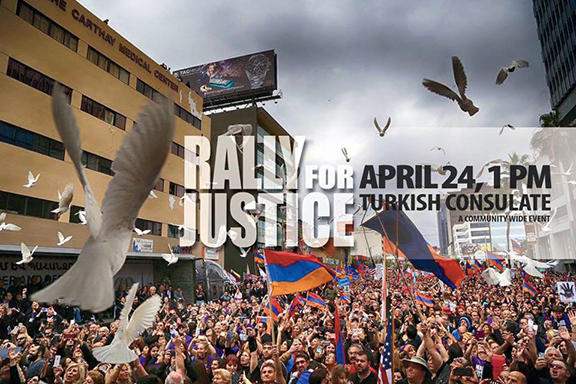 We call upon all segments of our community to join together in a RALLY FOR JUSTICE on Sunday, April 24, 2016, at 1:00 p.m. at the intersection of Wilshire Boulevard and Crescent Heights in Los Angeles in front of the Turkish Consulate as we continue to fight for a just resolution and against denial of the Armenian Genocide. As we enter the second century of denial of the Armenian Genocide, and following the worldwide uprising of the Armenian People on the occasion of last year’s Centennial, including the 166,000 thousand who marched through the streets of Los Angeles, organizational leaders in Southern California call upon the Armenian-American community to remain vigilant and active as we continue to voice our collective demands for justice. It is our belief that our voices are most loudly and effectively heard when they are unified, and to that end, we proudly announce the continued cooperation of community organizations to organize and execute the commemorative activities for this year under the banner of the newly formed Armenian Genocide Committee (“AGC”) consisting of the organizations and entities listed below. Further details will be forthcoming in the coming weeks.